Vélo Vogue: let them wear berets! 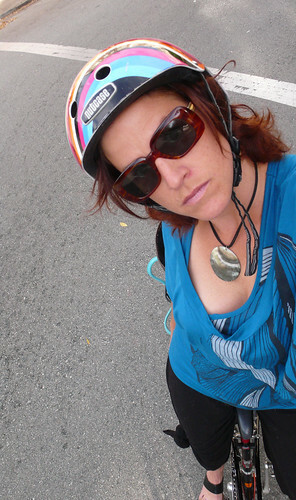 Once again, I'm hearing the helmet/no helmet debate being argued with equal vitriol from both sides because of Steven Jones' Op/Ed piece in the SFBG's Streets Issue that just came out during Bike To Work Week. Undoubtedly there are great benefits to wearing a helmet. And with pretty|funky|cute|sleek designs from companies such as Nutcase, Bern and Yakkay, the fashion-conscious can now see head protection as a beautiful accessory, and not dork material. The only two-cents worth that I can offer - the voice of one urban cyclist - is that this seems to largely be an American debate. I only wonder why I rarely hear Europeans discussing whether or not a cyclist is reckless because he/she doesn't wear a helmet. Coincidentally, I found this charming video last week in the blogosphere - the subject quite à apropos to our current debate. A classic French solution to headgear! À Vélo Citoyens! Ride Béret Baguette - SNTRCK Edit from SoundTrack on Vimeo. I think a big difference between biking in the US and biking in many European cities is that motorists in European cities are generally more accustomed to driving along with bikes. In the US, biking for transportation simply isn't as common and biking for sport often takes place off the city streets. Cars aren't used to working around bikes here. Maybe I'm over simplifying? 1.) In European countries, particularly the ones with high cycling rates, they understand that wearing a helmet is a minimal safety precaution, and that actually building their streets and making laws in a way that supports the safety of the road users is much more important. Therefore, they do that, and consequently, whether people wear helmets or not isn't such a big deal (both from the point of view of the government and the citizens). Conversely, here, we don't want to bother making the roads safe or making laws that protect anything but big business, so we just tell people to wear helmets in hopes that will shut people up about being safe while cycling. 2.) As Mikael calls it, the "Culture of Fear" - we're experts at this in America, much more than most European countries, and this is a big part of things as well. We're afraid to let our kids out of our sight, we're afraid to step into the street, we're afraid to be out of our homes past dark, and on and on. Every situation poses a million potential dangers, and we're experts at expounding on every one of them. The media is great at this, because it makes exciting news articles, which people read and assimilate without even thinking whether what's being talked about is a real danger or not (or enough of one to care about). On the topic of helmets, I don't really care one way or the other if any particular person decides to wear a helmet. I do get angry though about the heavy push for them from all levels of society here, the scapegoating of cyclists who don't wear them, the use of helmets as a cop-out for real action, and the blind acceptance of all of this by many/most people. My two (or fifteen) cents. "they understand that wearing a helmet is a minimal safety precaution, and that actually building their streets and making laws in a way that supports the safety of the road users is much more important." I'm always irked at persnickety motorists who think I'm not being safe for not wearing a helmet (or riding on a sidewalk) for exactly this reason above. If our streets are potholed and if there are no bike lanes nor signs that indicate that a motorist shares the road, they all get that Fahrvergnügen, and our streets become a place for the fast and furious! wearing a helmet should be obvious...i don't get the big deal about wearing a helmet. personally, i think it is quite silly to see those who don't (dare i say...dumb)... i see it as, your head, possibly your life or wear a helmet. seems like an easy choice to me...unless i lived in europe perhaps...but i don't. 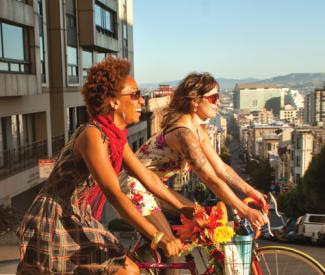 i too would love to see our streets + attention to cyclists, as well as pedestrians for that matter, change in our american culture; however, until that change begins manifesting I see wearing a helmet as essential to being a smart, savvy bicylist. Wow, I've never been called "dumb" before. I think mass cycle-wearing is usually practiced where cyclist are a minority - it's a symptom of cycling under stress if you like, where the onus is on the most vulnerable to keep themselves safe, as oppose to the big road users looking out for the small ones. People treat cyclists differently in places like Holland 'cos everyone has experience of cycling, and so drive considerately. Therefore no one needs to wear a helmet. Interestingly, as cycling grows and grows here in my native London, UK, I see fewer and fewer lycra roadies and fewer cycling helmets too. Ultimately, it's up to you - wear one or don't and let that be that. If you do wear one be aware of the limited safety track-record of helmets, and also of some of the more sinister movers behind the pro-helmet lobby. If you don't wear one, fine that's your choice, but do be aware of the potential dangers involved. Either way, you're an adult, make your own choice. However, compulsory helmet laws like they have in Australia and New Zealand are a whole different kettle of fish and do nothing for cycling at all. "all cyclists, helmeted or not, should be focussing on how they are treated on road by other traffic as their no.1 priority, not on bits of foam and plastic..."
Thanks for your comments from across the pond! @bodhisattvalisa: I've been called dumb (or worse things) many times for many different things, all of them being things I've put hours of careful thought and actual research into, but which the person calling me dumb simply disagreed with. The conclusion that because we aren't Europe helmets should be a given is both an over-confidence in helmets and a disregard for every other factor that has bearing in how safe you are on the road. I understand that you might consider for yourself that you need to wear a helmet, and that's fine. Telling me that I'm dumb for not wearing one, knowing nothing about me other than that I don't live in Europe is not fine. Personally, because of where I ride, how I ride, how I know helmets are designed and what for, how I am generally able to interact with the traffic I encounter, I don't feel the need to wear a helmet, and I have never felt endangered in traffic. For these reasons and others, I've decided I have much bigger dangers to worry about. Mostly pretty good comments here, which reflect my general thoughts on the subject. My short take on it is this: whatever will get people riding, do it. If someone won't go out on a bike without a mitre, then he should rock the mitre hard. Now, rockin' a mitre would be a whole new level of bicycle fashion! ...what Mark said is the same page that I'm singing from! It's certainly the choice of the individual to wear a helmet - oddly enough, I've not yet cycled in London without my helmet, but didn't use one when I was in Berlin...!